Starring: Jessica Chastain, Joe Edgerton, Jason Clarke, Mark Strong, Jennifer Ehle, Kyle Chandler. 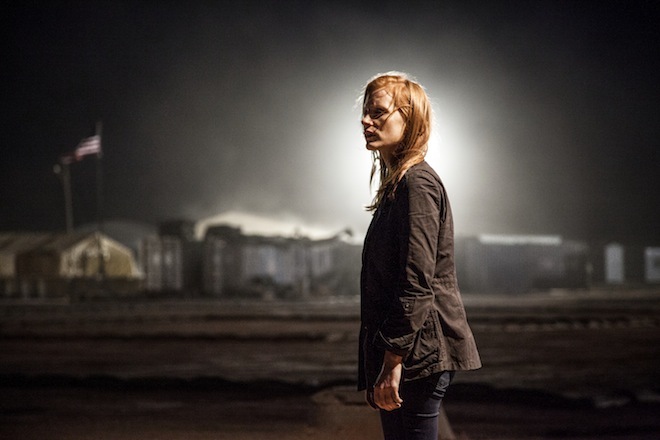 Zero Dark Thirty falls neatly into the category of a historical drama like Apollo 13 and All The President’s Men, where we all know the outcome but getting there is the important thing and Oscar winning director Kathryn Bigalow’s follow-up the the superb The Hurt Locker is far from a disappointment and is one of the most intense, gripping thrillers I have seen in a while. Originally intended as an examination of the pressures of trying to find the World’s most wanted man, Bigalow and writer/producer Mark Boal got to complete their opus when, in 2011, that very man was found, giving them the perfect ending. So what we have here is a two hour tease to the finale 30 minutes, in which, equipped with night-vision goggles and flying in on stealth helicopter, the US army hit their target. Don’t, however, think that it is all about those final minutes. Getting there is a tremendous journey. The first 20 minutes are incredibly unsettling as Maya faces her first interrogation which, completely denied by the CIA, includes an almost continuous torture of a prisoner, from the humiliating to the physical to the almost pleasant conversation. It doesn’t so much set the tone of the piece but shakes you up as we follow this almost totally naive young woman to becoming a hard-nosed, obsessive who won’t stop at anything to get this evil tyrant. We are led down many roads in which acts of terrorism interrupts the investigations and even puts Maya under threat when she becomes a target. Having then gathered the facts she needs, she has to face another battle within the confines of the CIA as they sit on the house doing nothing, Maya constantly reminding them by writing on the window of her boss the amount of days since she delivered the information. It is all credit to Bigalow and writer Boal that they don’t suffocate the audience with facts. In fact, we learn more from what is not being said than anything that is vocal. In one such restrained scenes, Maya is asked to explain herself to the CIA Director why she has devoted her career to the efforts of hunting Bin Laden, she says nothing. Characters come and go without us learning anything about them. The only person we watch grow is Maya and this is due to the career changing performance from Jessica Chastain. She is simply magnificent as the woman who we first see as a mouse and then slowly becomes tougher than some of the Army officers she meets. It is also done with total restrain, only once does she scream and shout. It should go down in cinematic history as one of the screen’s best female roles and I would imagine she will win the Oscar. It is that good. Whereas The Hurt Locker was an exciting, action-packed thriller this is a slow burner that grips from scene one and never lets go. 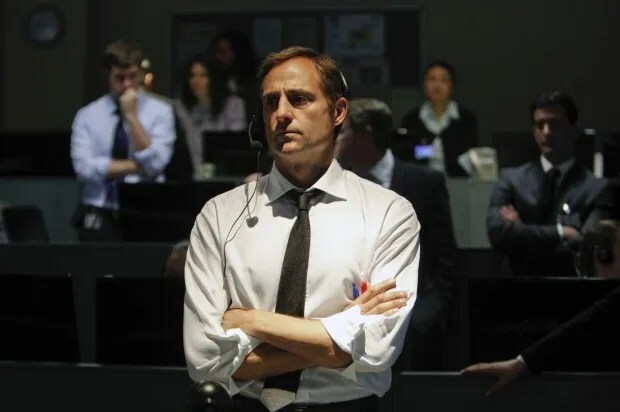 Even it’s long running time flies by as you become immersed in the story and with some strong support from the likes of Mark Strong, Jennifer Ehle and Joe Edgerston, this is Bigalow’s best film to date. A thoughtful, intelligent piece of flag waving without once being being in-your-face with its patriotic bravado. In a month where major award nominated films are coming at us every week and there are only a handful worth seeing, I urge you to go to this terrific film. Bigalow should now have her name mentioned along the likes of the great directors because that is exactly what she is, while Chastain is an actress to keep your eye on in the future. This is her movie and she utterly commands every scene.